People watching the Wii. Picture by Patrick Haney. In this twilight episode, I would like to consider the two aspects of our collective work. This consists on the one hand, of our research over these last six weeks, in and through the Web, and on the other hand, the very physical space that will frame our project at the end of the year. While the form of the blog, defined as a short term work, led us to favor mediated connections and meetings, how do we present and represent ourselves there? The question representing one’s Self on the side of Fiction and simulation games, such as Second Life, has been largely investigated by artists during the last decade. For instance, the question of the “avatar” was the center of the work of Alain Della Negra and Kaori Kinoshita, who have been running a blog on the Newspaper “Liberation”. Neighborhoods, Alain Della Negra and Kaori Kinoshita, 2005 (excerpt). Salvatore Iaconesi and Oriana Persico consider the gap between one’s behavior in parallel worlds and the lack of impact on every physical being. In the statement of their project OneAvatar, they suggest that what differs between these two is the narrative linked to the latter1. They will attempt to reconnect physical feelings to the avatars, proposing to get out of virtual world games and inside of the exhibition space. 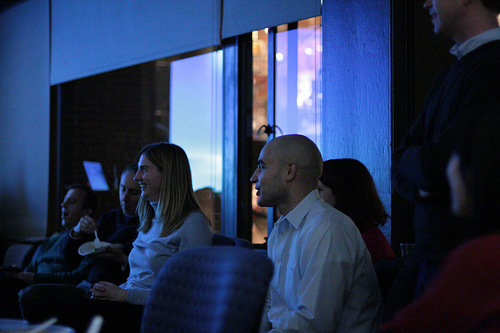 The other people just watch, the way friends do when the best is playing the Wii. In this case, the gap between me and my other Self is actually the same than for role-playing. It is about playing. Social Networks, on the contrary, don’t deal with “Avatars” but with “profiles”. In her recent article “My Facebook, My Self”, Jessica Helfand evokes the sense of privacy you have towards online scrapbooks following the generation you are a part of. In social networks and on sites you have to get logged in, you leave your registration and consciously accept to be traced, which sounds uncanny for people who were not born with biometric passport and microchips transport cards that allow to map your comings and goings in the “real world’. In their project Life Sharing, started in 2000, Eva and Franco Mattes give free access to the datas of 0100101110101101.ORG’s personal computer. Thomas Traum2’s Me Surfing carries away the surfer into his own endless surfs. On the Internet, there are weird and undefined black holes, that seems both strange and fun. 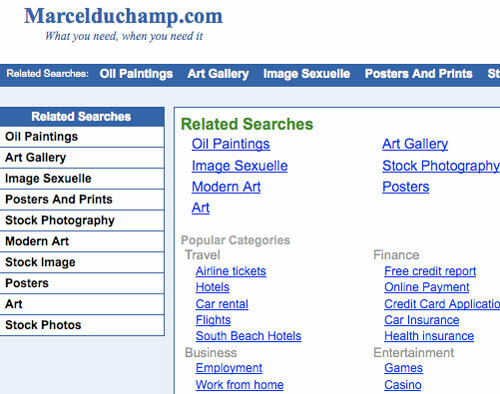 Constant Dullaart entitled his Webpage “Ready Mades”, that consists in a directory of domain names for sale. These addresses have been bought on the first hand as acquisitions by speculaters. In order to be profitable while they are not sold, some advertising links would appear on them, presumably to be in connection with what one was researching on this page. Such works, that collect and connect datas, play with the very rational fear linked to societies of control. This “inframince” space gives birth to another kind of meaning and knowledge that finds its place inside of the empty left ones allowed to information and comments. For instance, Wikipedia Art project page could officially stay on the official Wikipedia site – that treats and validates informations as true - about fifteen hours before going back to another out-of-the-institutional-Network endless galaxy. Beyond conspirancy and games, is the Web what makes life more interesting than the Web? 1. On the notion of interface, see the article by Dmitri Siegel in Design Observer, “Interface Space”. 2. On the avatars, see the Journée d’étude PraTIC « Avatars en ligne » programm [FR]. 3. On archiving, mapping and representing correlated traces in time and space – before Web 2.0, see Franck Leibovici’s essay, Des documents poétiques, dealing with Mark Lombardi’s drawings. On Mark Lombardi’s drawings, see also this article by Michael Bierut in Design Observer, “Mark Lombardi and the Ecstasy of Conspiracy”. You even can buy medals for video games’ veterans. Together with Constant Dullaart, Thomas Traum took part to a the project Let’s meet in real life. Posted by Marlène Perronet	on Monday, March 16, 2009 at 16:00. Filed under Tellings, Event, Fiction, Media, Narrative, Online, Reality, Relational, Simulation, Video.